After a long week's worth of barbecue in North Carolina due to a recent trip, Duc and I were feeling almost at our limits for smoked meats...but then again, how could you deny the smoked meats after knowing just how much care and attention went into perfecting the art? 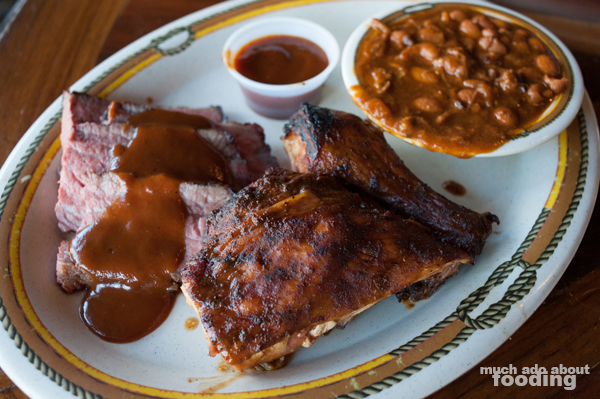 We've always known others in Orange County to say that there isn't any decent BBQ in the area, or if there is, the restaurants are rare gems. I'm not surprised - it just isn't in the culture here in southern California. 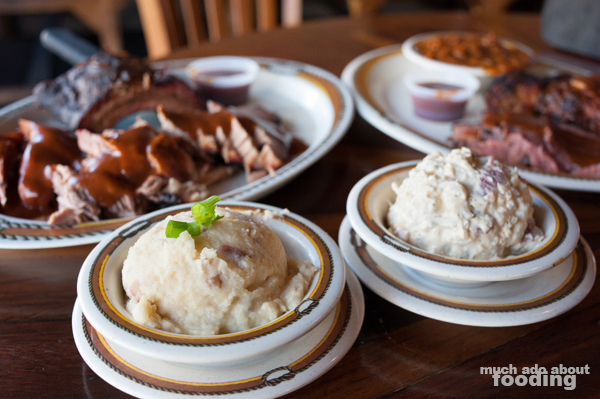 However, that shouldn't deny those who have brought the skill to the area and with 10 years under its belt, Bad to the Bone BBQ in San Juan Capistrano has gifted us just that around these parts. 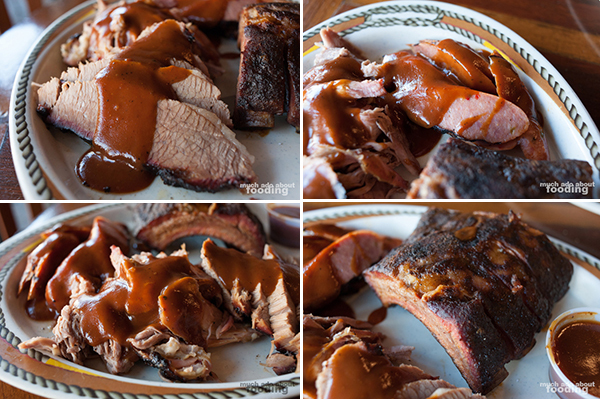 "BBQ is hard to do consistently every day but we do our best to start with a quality product. 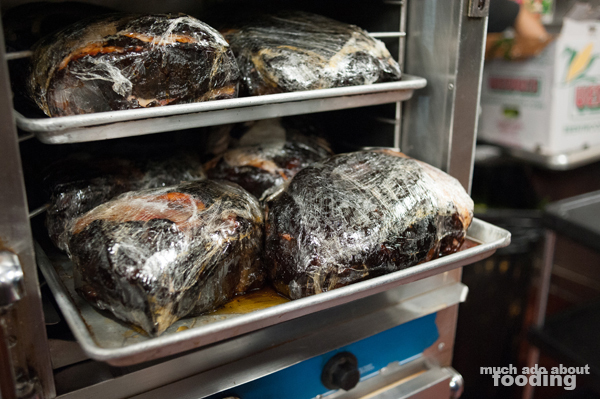 All of our meats are Choice-grade and nothing is frozen. 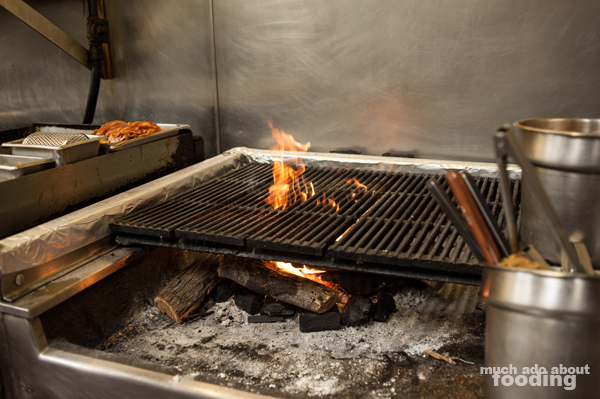 Everything's fresh as possible - 95% of the menu is made in-house from beans to BBQ to potato salad to fries. We even make our own hamburger patties which are 1/2 lb three-way mixes of short rib, chuck and brisket." 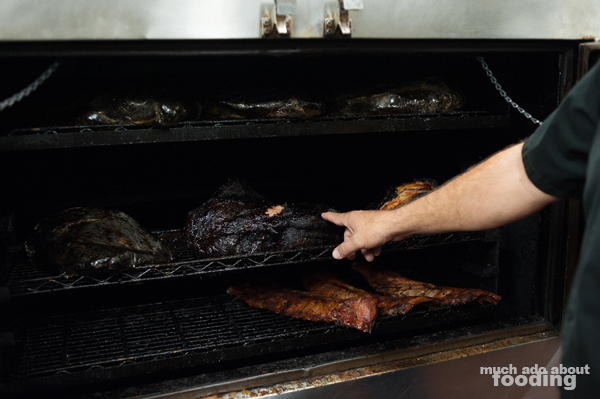 "BBQ has always been a passion of mine. I love cooking, and I love the process. It's time-consuming but it's great." What started out as a small 30-seater fast-casual joint quickly bloomed into what it is today - a restaurant hauling out a few thousand pounds of brisket on a weekly basis and upward of 225 racks of ribs on busy days. Normally, weekends see Bad to the Bone dishing out 75 slabs of baby back ribs, 50 slabs of St. Louis ribs, and 25 slabs of beef ribs. Talk about volume! 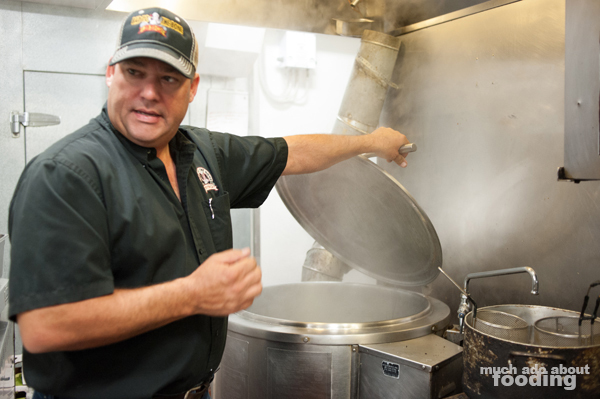 The in-house BBQ sauce is finished to the tune of 150-175 gallons a month, all made in-house. 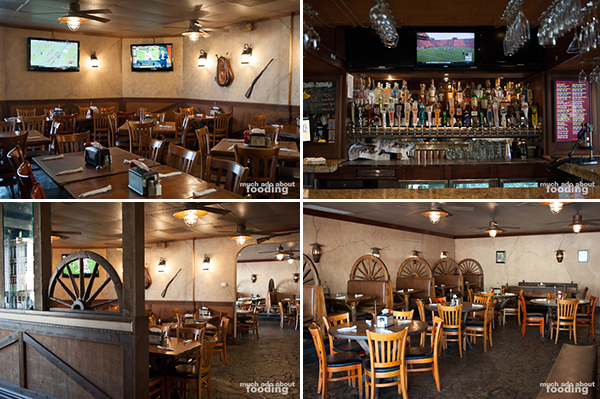 With their weekly specials and extensive, diverse menu, they certainly have their work cut out for them. 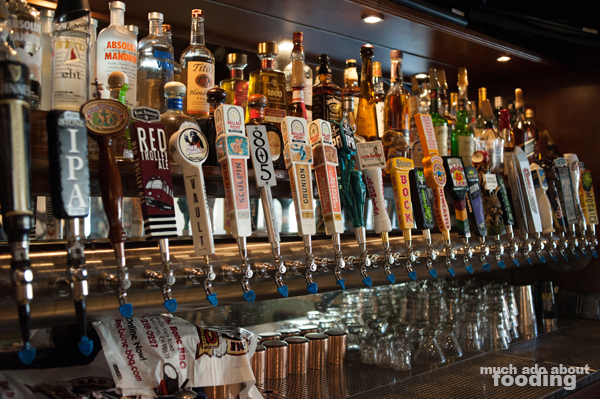 Walking into Bad to the Bone, you'll see full service on one side with orders taken at the table both inside and at the two outdoor patios, quick counter service in the main area, and a well-rounded bar on the other which features 25 beers on tap and constantly updates via Taphunter. A take-out counter also allows you to pick up orders called ahead and features all of the regular menu items as well as bulk packages for families or parties from sizes 8-30 heads (BBQ travels well after all). Are all the recipes yours? How'd this all get started? Yes! The recipes are mine, and I've given a lot of attention to everything from the sauce to the beans. I grew up in Oklahoma doing rodeo. My family is into horses and ranching but when I met my wife in California on the pro-rodeo circuit, I ended up moving here in the late 90s. My uncle has a small three-item restaurant in Oklahoma so I have always loved the food business and cooking. I got started here by catering events with a mobile BBQ smoker and moved on up. Now we're at one location but looking into other opportunities in Orange County. Time-intensive? Indeed. With each meat item, there is also the inclusion of their in-house sauce which is formed with a tomato base and plenty of vinegar in almost a Kansas City style. Best served warm, the sauce is given at just the right amount but those wanting more can always request it. Future plans will include a sauce station for those that want extra, and because the sauce is at its peak flavor when warm, there is no sauce on the tables to dab onto your slabs. At this soon-to-be station, Marty hopes to include three signature sauces and a rotating weekly special; in the meantime, you'll have to be on the lookout for their bottled sauces which are planned to hit retail stores. With all this talk about the history and how the food got started though, what about the actual goods themselves? We finally sat down and were helped out by Chad who brought out a smorgasbord of Bad to the Bone goodies: BBQ chicken, medium rare tri-tip, brisket, pulled pork, sausage, BBQ ribs, garlic bashed potatoes, homemade mac n cheese, fresh cut fries, potato salad, Ranch beans, tropical iced tea, sweet tea, and sides of spicy sauce. 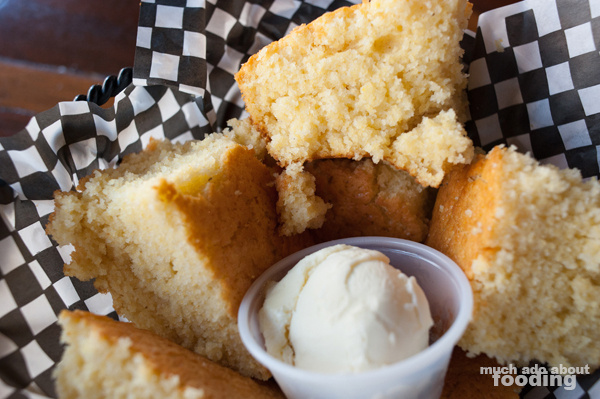 To start off the feast, we dug into a basket of hot-out-of-the-oven cornbread which was moist but fluffy. The pieces came out appropriately with a honey whip which gave smooth sweetness to each bite. To rev up our appetite, we went for their side dishes first among the options. On the menu, sides dishes are $2.49 each with an extra $1.99 added for "premium" sides. 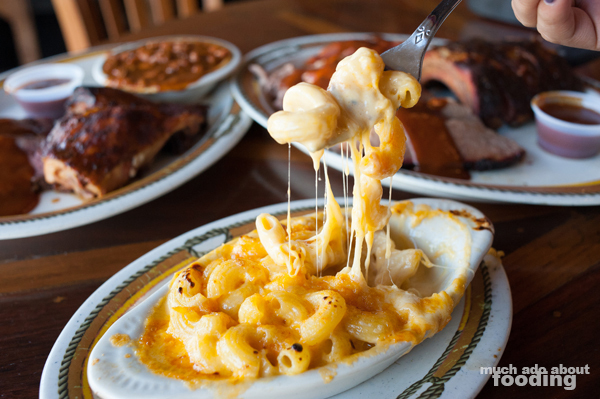 Classic ones include Ranch beans, cole slaw, potato salad, French fries, sweet potato fries, garlic bashed potatoes, onion rings, fried okra, steamed veggies, and sweet corn (seasonal) while the Premium ones are their baked potato, mac 'n' cheese, grilled veggies, and steamed broccoli in cheese sauce. We were enthralled by every one of their sides that we tried from the savory Ranch Beans featuring shredded meat to the garlicky, creamy Garlic Bashed Potatoes to their chunky, flavorful Potato Salad to the cheesy, indulgent Mac 'N' Cheese to even the fresh-cut and freshly fried French Fries. If nothing else, sign me up for a buffet of their sides options! So while there are mainly smoked meats on the menu, Bad to the Bone still has a variety of soups, salads, and sandwiches for your choosing. 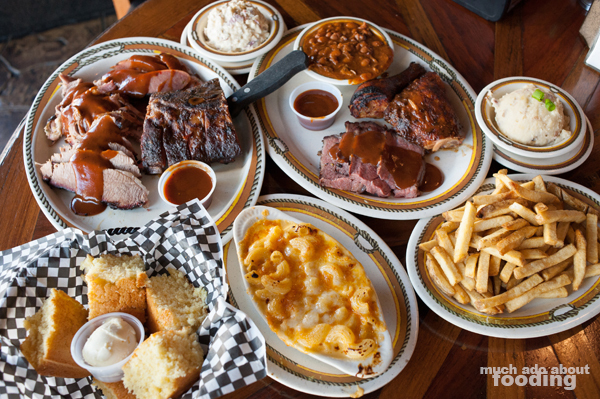 If it is difficult to decide which of the meats to opt for, you can select combo plates which comes in two-meat ($17.95), three-meat ($19.95), and four-meat ($21.95) options along with two sides. Our first plate was a four-meat one which featured Sliced Brisket (stand-alone order $14.95 - marinated with dry rub, slow-smoked, 18-20 hours, sliced with BBQ sauce), Tri-Pepper House Sausage (stand-alone order $14.95 - served on bed of grilled onions and peppers), best-seller Carolina Pulled Pork (stand-alone order $14.95 - fresh pork shoulder, 14-16 hours, hand-pulled, tossed in Carolina sauce), and St. Louis Ribs (stand-alone order $19.95 for half (5-6) and $24.95 for full (11-12)). For all of these, the smokiness really highlighted the natural savoriness of fully-cooked red meats but the degree of seasoning made each special in their own way. The brisket had a rich flavor augmented by the sauce while the sausage was well-balanced on its own with stuffed spices. The pulled pork came with a special vinegar-based sauce that I could claim authentic to the style; it was apparent why this option is their best-seller. As for the ribs, they had just the right amount of caramelized seasoning on the ribs. Our second plate featured the Fire-Roasted Tri-Tip (stand-alone order $14.95 - Certified Angus beef tri-tip, marinated with dry rub, slow-smoked, finished on grill and basted with BBQ sauce) and BBQ Half Chicken (stand-alone order $14.95). The tri-tip was moist, coating your mouth with its juices with each mouthful, and the chicken was clean and not too dry which much smoked poultry becomes. Concerning quantities, this two-meat plate seemed the perfect amount to indulge in and get a taste of different options without overdoing it. After all, that meat sits heavy, and there are two sides that go along with each plate. Of course, we couldn't manage to devour everything so doggy-bagged the rest, only to discover that Bad to the Bone does think of everything. 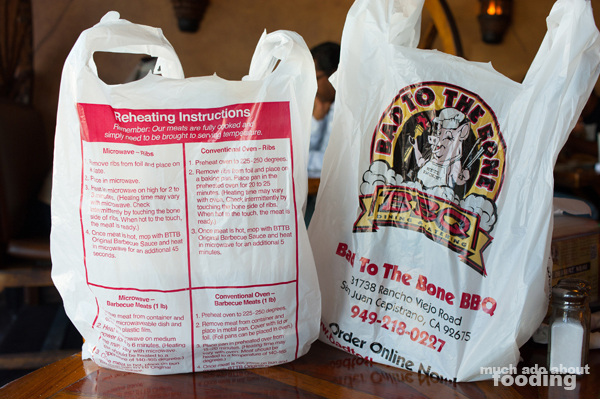 The plastic bags have reheating instructions per meat type on their side so you don't even have to worry about overcooking your leftovers! 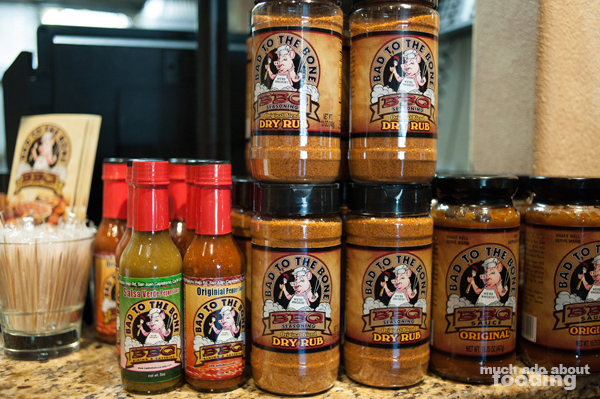 If you are looking on grabbing to-go, note that you can also buy their meats in bulk by the lb or slab as well as snag seasonings and sauces to go with everything. After learning about their operation here and getting tastes of their food, we can see now why it is an Orange County favorite for barbecue. Photography by Duc Duong. More photos are available on Facebook here.